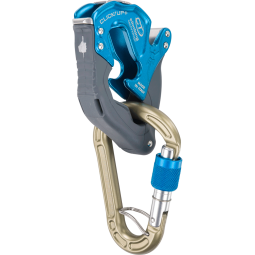 Innovative belay device developed for sport climbing, easy to use, intuitive, safe, extremely lightweight and compact. Most complete and versatile belay / rappel device ever produced. It is extremely advantageous and it can be used with half, twin and single ropes. Multiuse belay / abseil device with innovative and compact design and it has a modular braking system to optimise braking with all types of rope. Combination kit with BE UP + CONCEPT SGL carabiner. A multipurpose rappel/belay device made from a hot forged light allow, ideal for rescue operations, such as the lowering of loads or difficult recoveries with static and dynamic ropes. Combination kit with CROCODILE + PILLAR SG carabiner. Multipurpose hot-forged light alloy belay / rappel device. Combination kit with GROOVE + PILLAR SG. Hot-forged light alloy tube-shaped belay / rappel device, equipped with V-shaped braking grooves for greater braking ability. Combination kit with DOBLE V-ROW + SNAPPY SG. Classic hot-forged light alloy tube-shaped belay / rappel device. Easy to use, compact and practical. Combination kit with DOBLE + SNAPPY SG. Hot forged light alloy figure 8 belay / rappel device with breaking load of 25 kN. Hot forged light alloy figure 8 belay / rappel device with breaking load of 30 kN. Classic and hot forged belay / rappel device ideal for belaying the leader in a dynamic way and for a safe abseiling. Hot-forged light alloy 8-shaped belay / rappel device with curved profile that allows two different descent speeds. 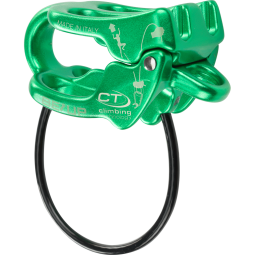 Light alloy descender equipped with a spring lock lever that allows to insert the rope without removing the harness carabiner.